I have been reading about the various ideas for converting Norris Hall into a memorial, or razing the building, and various other ideas. I feel similar sentiments and feel that the victims and the heroes deserve some sort of memorial. BUT… What concerns me is that the more we make of this, the more attractive it becomes for a mentally disturbed individual like Cho to execute a horrible act like this, knowing that he will make a permanent mark on thousands of people’s lives, memorials will be built, and so forth. In memorializing the victims we are also memorializing the perpetrator(s). This is unavoidable. In a free society under rule of law and with a free press that makes money from sensational stories, it seems nearly impossible to minimize the notoriety that a person like Cho feels they will achieve. A similar situation is found when it comes to terrorists. Combating terrorism directly is nearly impossible, but there is a way to stop terrorism: By definition, a terrorist seeks to terrorize and cause fear in the population. He achieves this through the notoriety of his acts. If terrorist acts were kept as quiet as possible, and terrorists themselves were apprehended and “disappeared”, Latin-American style, without the slightest news or the tiniest footnote in the newspaper, terrorism would cease. If you take away the one purpose that a terrorist hopes to achieve, he will stop. If nobody knows of his actions there’s no point to terrorism. To support my point, I’ll cite a striking example of one arena where this “silence tactic” was applied, and that is by the Israelis with respect to airline hijacking. Those of you who are old enough will remember that during the late 60’s and early 70’s, hijacking of Israeli airliners by Arab terrorists was very common. It seemed like there was one every week. These hijackings would involve extensive negotiations, lots of news coverage, hostage exchanges, timed exchanges, exchanges for money, fuel, and safe passage, etc., etc., and they would go on for days, with food being brought to the plane as it sat on the tarmac for several days with 100 hostages onboard. These weekly hijackings came to an abrupt halt in the late 70’s when Israel introduced and implemented a new plan. When an Israeli plane is hijacked, there is no news coverage until it’s over, and it is over very quickly. Wherever the plane lands, it is immediately stormed by ruthless, heavily armed and armored troops who enter the plane and simply shoot anything that moves. They try not to hit innocents but sometimes they do. They simply move quickly and wordlessly through the plane, Uzis blazing, until every terrorist is triple-dead. The only thing that is reported in the newspaper is that a hijacking occurred and 8 nameless terrorists are dead. That’s it. Those hijackings stopped cold because the Israelis removed the purpose, which is notoriety and news coverage, airing of demands, etc. A hijacker now gets none of that. Hijacking an Israeli plane means an anonymous suicide and nothing more so there’s no point in it for the would be hijacker. The Germans also had problems with hijackings, although less severe than Israel. The Germans also adopted the Israeli tactic and bingo, no more hijackings. I brought up the hijacking example to illustrate what happens when you remove the one thing a terrorist wants to achieve. A terrorist-act-minded individual, like Cho, is aware of the “impact” he will make and the lasting memorials that will remain. He knows that he will become instantly famous, and his thoughts and writings will be read by millions, and that’s what happened. In a year or so there might be some new laws passed that will be named “Cho laws”. In ten years they’ll probably make a movie. The name “Cho” will be famous for decades. Unfortunately, and he will be far more famous than any of his victims. How to change this situation is not clear. It might be impossible in a free society. But it would be good to bear in mind when we make much of events like what happened at Virginia Tech. In a country of 300 million people, there are surely more sick individuals in the population right now that envy Cho and wish they could achieve something similar. The more we make of it, the more attractive it becomes to those who would imitate. A hundred years ago such things happened far less often because news coverage was poor and slow. Notoriety was not guaranteed like it is today. I wonder how many people consider this aspect that I have just brought up, of events like the Virginia Tech massacre. I wonder if it is even brought up in discussions about what to do with Norris Hall. Norris Hall is just a building, an inanimate object. I think it should be restored to it’s previous condition as quickly as possible and put back into service as before. It should not be turned into an icon because in the end, it memorializes the perpetrator more than any of the victims. 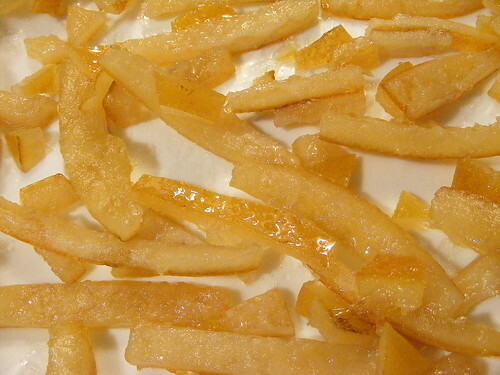 Making candied orange peel is easy once you learn what to watch for. Expect a couple of spoiled batches where you undercook or burn the product, but after that it’s straightforward. The number of oranges to use is hard to specify. I eat two oranges a day and save the peel. Since I want as many long 1/4 to 3/8 inch wide strips that are 2 inches long, I cut the oranges in half and juice them or quarter them and carve out the inside (and eat it). Then I wash the peels under running water, and scrape as much of the meat off as I can and then toss the peels into a sealed plastic bin I have in the refrigerator. The sealed bin has a small amount of water on the bottom to keep them hydrated, otherwise the refrigerator will dry them out and they’ll shrivel. When I have “enough”, I get the cutting board and start slicing as many long pieces as I can and I dice up the odd pieces, and continue until I have enough to fill a small 16 cm stainless saucepan about 3/4 full (but not more). Next the peels optionally get boiled in the saucepan. Boiling them like I describe here will reduce the flavor and remove bitterness. It will also help to hydrate any peels that have dried and thinned. You can skip the boiling steps here for a stronger orange flavor. If I’m going to use the peels for baking I skip the boiling to get a stronger flavor. To boil the peels, fill the saucepan with water, and boil for 10 minutes or more, dump them into a strainer and hit them with cold water. Then back in the pot to boil again for 10 minutes or so, dump and rinse with cold water. Next comes the candying step. Put 2 to 2-1/2 cups of sugar in the saucepan and 1 cup of water, bring it to a boil and dissolve all the sugar. Be careful from here on because the sugar syrup will be at 240 degrees F. Treat it with respect because it WILL hurt you–think napalm. Gently add the peels to the boiling syrup, bring back to a boil, then reduce to medium heat and cook them in the syrup (uncovered). I’ve seen recipes that say to cook for 20 minutes. Forget that. It takes 40 to 45 minutes of cooking. The whole time it will be merrily bubbling and foaming. Stir occasionally to make sure nothing is sticking or burning. When you get to around 40 minutes, you’ll notice the amount of liquid is getting less and less and now is where you really have to pay attention. You want the peels to get that “glassy” candied look–not all the way through, but you want to see the flesh start to get glassy. Some people say to boil until all the syrup is gone. If you do that, you’ll burn the peels. There’s a fine line where they are “just right” and it always seems to come at around 45 minutes. While it’s cooking, I’ve put out sheets of waxed or parchment paper. When the decision point comes, dump the contents of the pot into a metal screen strainer (remember it’s at 240F which will melt some plastics) and let it drain for a minute. Then spoon them out onto the waxed paper and as quickly as you can spread them out so they are touching each other as little as possible. When they cool they will stick together and it’s pretty easy to unstick them from the paper but not from each other. Then let them cool off and dry for a while, an hour or two, and then you can use them or cover with another sheet of waxed paper. You can stack several batches on top of each other, put a dinner plate on top, and store them like this for several days. Finally, you can sprinkle them with flour and mix them into a cake. You can dip the long ones in melted chocolate (just like strawberries). You can coat them with powdered sugar, use then to garnish ice cream, whatever. To try this out I’d recommend starting with four oranges worth of peel. The thickness of orange peels varies a lot so it’s hard to say how many oranges you need. Thick skinned oranges are great for this application. Oranges with very thin skins are not good choices for candying. You can also do this with grapefruit skins for a very different flavor. 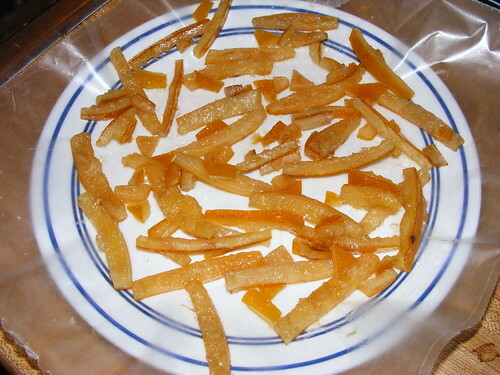 For me, candied orange peel is one of the greatest flavors on earth, and it’s extra fun to make because you are using what would otherwise be garbage plus about 20 cents worth of sugar. However, it is labor and time intensive. I found an interesting article below and it agrees with my observations down in the trenches with the poor people, which includes myself, my daughter and everyone she knows, various other friends, and discussions with my landlady on this topic about her other tenants. (She owns a number of income properties). Money has been getting tighter and tighter for everyone and it’s now at the point where people just can’t make ends meet anymore and they have zero disposable income so there are no vacations, no nothing. People are getting worked to death just like in the 1800’s. is right on target because salaries and benefits have not kept up with inflation at all. A salary of $100,000 is still considered “quite high” by today’s PERCEPTIONS but in fact a $100,000 salary today is what a school teacher made not too long ago in terms of buying power. What this says to me is that American big business has pulled off a marvelous sleight of hand. Everyone’s salaries have been cut by 70 percent without actually reducing the numbers, and I’ll bet the benefits of this are flowing into somebody’s pocket. Americans today are working far longer hours and far harder for less buying power. Now who do you suppose engineered this, or is it simply the effect of profligate spending made possible by foreign confidence in the U.S. economy? What happens when that confidence wanes? What happens when Europe unifies its capital markets, as it’s now doing, and becomes a far more attractive place for big investors like China than it is now? What happens when the massive influx of capital to the United States slows down? It’s okay to humiliate and traumatize innocent citizens? That’s what a recent statement from attorneys representing the New York Police Department are, in effect, saying. According to attorneys representing NYPD officers, a breathalyzer test for them is “humiliating and traumatic”. If that’s so, then why are citizens of the United States subjected to a procedure that is “humiliating and traumatic”? It’s nice to know that our mid-level government employees are traveling in style. The GAO so far has uncovered $146 million in unauthorized or inappropriate air fares in the first half of 2007. The cases involve the breaking of rules such as those requiring federal employees to travel in business-class at $800 and not first-class at $6,000 and so forth, which happened 44,000 times. but the rulebreakers feel they are worth it ‘cuz their work is so important.